Salamis (Greek: Σαλαμίνα Salamína, Ancient and Katharevousa: Σαλαμίς Salamís), is the largest Greek island in the Saronic Gulf, about 2 km off-coast from Piraeus and about 16 kilometres west of Athens. 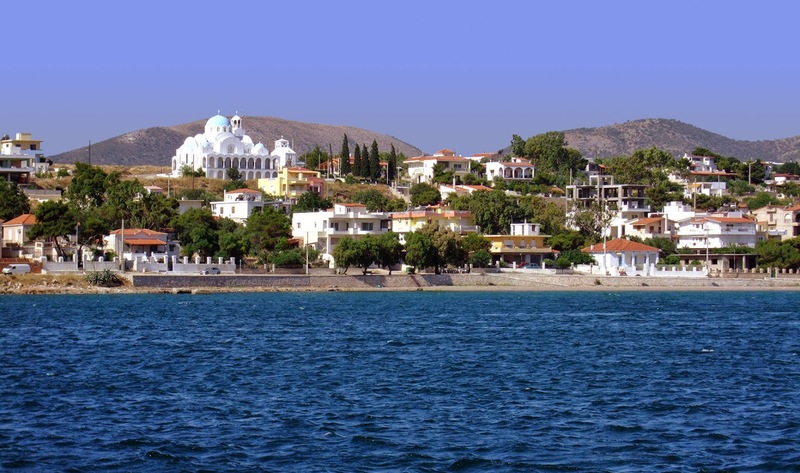 The chief city, Salamina, lies in the west-facing core of the crescent on Salamis Bay, which opens into the Saronic Gulf. The island's main port, Paloukia, in size second only to Piraeus, is on the eastern side. Salamis has an area of 93 square km; its highest point is Mavrovouni at 404 metres. A significant part of Salamis Island is rocky and mountainous. On the southern part of the island a pine forest is located, which is unusual for western Attica. Unfortunately, this forest is often a target for fires. While the inland inhabitants are mainly employed in the agricultural sector, the majority of Salamis' inhabitants work in maritime occupations (fishing, ferries, and the island's shipyards) or commute to work in Athens. The maritime industry is focused on the north-east coast of the island at the port of Paloukia (Παλούκια), where ferries to mainland Greece are based, and in the dockyards of Ampelakia and the north side of the Kynosoura (Greek: Κυνοσούρα = "dog tail") peninsula. Salamis Island is very popular for holiday and weekend visits from the Athens and Piraeus area; its population rises to 300,000 in peak season of which c. 31,000 are permanent inhabitants. This supports a strong service industry sector, with many cafes, bars, ouzeris, tavernas and consumer goods shops throughout the island. On the south of the island, away from the port, there are a number of less developed areas with good swimming beaches including those of Aianteio, Maroudi, Perani, Peristeria, Kolones, Saterli, Selenia and Kanakia. How beautiful! So many things to see in this photo, I don't know what to mention first, so I'll just say I love the whole picture! Beautiful! It kind of reminds me of California's Central Coast.